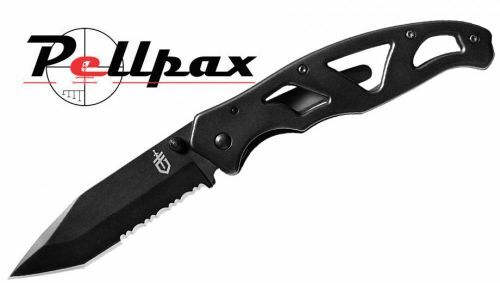 Home » Blades » Knives » Folding Knives » Gerber Paraframe II Tanto Point Knife 3.5"
The Gerber Paraframe II is a light weight camping knife that features a combination straight edge and serrated blade which will make light work of a variety of tough materials. The handle of the Paraframe is lightweight and yet strong thanks to its skeleton frame construction that is made from stainless steel that is completely immune to rust, corrosion and staining. The tanto point of the Paraframe makes it perfect for outdoor conditions and combines the best sapects of both a slicing and a puncturing blade. Gerber Paraframe II Tanto Point Knife 3.5"
Add this item to your basket & spend an extra £462.01 to apply for finance.